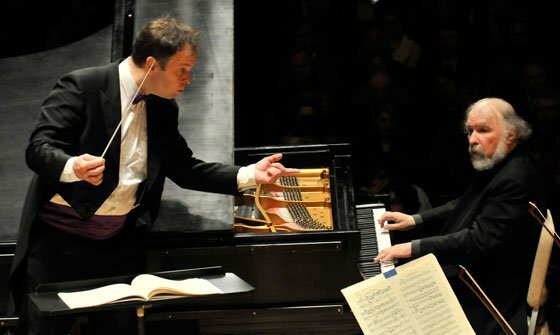 This week’s BSO concerts, which I heard on February 3, feature a Finnish conductor, Sakari Oramo, a Romanian pianist, Radu Lupu, and a blend of German and Russian music, all of which in the wrong hands might have produced curious results, but in these turned out to offer an engaging and penetrating evening. Pianist Radu Lupu’s leonine mien is belied by his playing, which is more patrician than roaring lion: the Beethoven Third Piano Concerto was intensely introspective at Lupu’s hands. Conductor and pianist appeared to be of a mind about this, although I’d swear that twice I saw Lupu gesture with his left hand toward the players, asking for even softer dynamics. His sotto voces are all at the service of the music, even if from time to time one might wonder whether Beethoven should be this subtle and reflective. This approach may not be for everyone, but to these ears the elegance and limpidity of his touch were grounded not only in a solid piano technique but in the earth itself, from whence it seemed to spring effortlessly. The first movement cadenza confirmed his approach, that of making the piano more partner with the orchestra than virtuoso soloist: no pyrotechnics or flash-in-the-pan here. The second movement continued in the same vein, perhaps to slightly diminished effect, though still with gorgeous tone and a sense of deep humility at keeping company with this, perhaps one of the most beautiful slow movements of any concerto. The third movement continued the subtle but beautiful pattern of clarity and grace. The door to transcendence seemed to open repeatedly, and Beethoven’s surpassing score swept us along in unexpected ways that seem much different from the fire and brimstone of the later piano concertos. The program opened with Mussorgsky’s Night On Bald Mountain, in a reading of clear texture and firm conviction. Oramo was truly in charge of this superlative ensemble, and they played as though they liked what he asked them to do. Rimsky-Korsakov’s orchestration makes eminent sense of Mussorgsky’s fragments, left behind at his tragic and early death, and gives this witches-brew of music its due. It is hard to imagine any orchestra’s playing this any better than in last night’s performance, and elegant solos here and there were matched by fire-breathing ensemble effects. Prokofiev’s Sixth Symphony sounds like a paean to the suffering of the people of war-ravaged Russia in the first half of the twentieth century. This is agonized music, and even when the sun finally appears in the last of the three movements, the clouds are soon-enough promising the return of the storm. The bold, unison, jagged intervals of the opening phrases of movement one give the faint-hearted listener fear for what is to follow, and the suffering of Prokofiev’s fellow countrymen and women are never far from the surface. Needless to say, the brass, and—surprisingly, the piano and celesta—have much to do in this mélange of emotion and declamation. The composer asks especially of the brass players that they exploit the range of their instruments, and he combines myriad instruments in unusual and telling ways. At one point, I’d swear I heard the deep organ pedal stops, but the console was not on stage: how did Profkofiev achieve that other-worldly sound? Perhaps this work should be called the “Stalin Symphony” for its evocation of suffering and pain. In all three works, perhaps most especially in the Prokofiev, the BSO played as though their lives depended on it, reminding us what a truly astounding ensemble they are, and giving of themselves to expressing so clearly to us the inner world of each piece. Kudos to Maestro Oramo, to the magisterial Radu Lupu, and to the BSO for giving us such an unusual and memorable evening in the middle of this snowy Boston winter. Brian Jones is Emeritus Director of Music and Organist at Trinity Church, Copley Square, Boston, where he directed an acclaimed program from 1984-2004. He is active as an organ solo artist and guest conductor, and has performed widely in the United States, Canada, England, Mexico, and Bermuda. He is Director of the Copley Singers, a Boston-based chorus, and his work with the Trinity Choir may be heard on the London-Polygram, Dorian and Gothic labels. I heard the performance on February 8th, and it was every bit as good as you say. The Beethoven was a revelation. I have never heard it played with such sensitivity from both the pianist and the orchestra. Perhaps with a few more performances under their belt on Tuesday the conductor and the soloist were even more of one mind, both for dynamics and timing. The middle movement was nothing short of sublime. From where I was sitting in row J I could not see much of Mr. Oramo during the Beethoven, but I had a good view of him during the Profkofiev. He conducts with immense energy and precision. He uses his body and his face (which I could get many glimpses of) to project this energy onto and into the orchestra, and they respond. During the dance section of the third movement he was all over the podium, dancing, jumping, and weaving – impossible to misunderstand exactly what he wanted to hear. And we heard it. He is a young conductor of immense talent, and I look forward to hearing much more from him. I agree with Romy (if not to her degree) on the Mussorgsky – not a great piece of music IMO and somehow as well the performance did not hold together. I disagree with both Brian and David on teh Beethoven, which was less sublime than to these ears facile and understated. Visually, Lupu seemed flaccid, uninvolved, appearing as if in a “I can play this in my sleep” mien. Oh, some nice turns of phrase, especially in the slow movement, were offered. But basically the whole thing regretfully did not draw in this listener. But ah, the Prokofieff! Oramu came into his own with his incisive, throbbing, insightful performance of Prokofieff’s greatest symphony. Perhaps I should’ve come in after the intermission for the real music-making. .